The Window/Door Cap blocks water from getting behind siding and causing moisture damage. 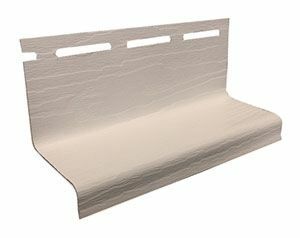 Designed to direct moisture away from the from the siding. Made with heavy duty vinyl to last for decades. Protects water infiltration around windows and doors. Comes in a pack of 50 pieces. Harbor Ridge Rustic siding's deep lap profile provides enhanced beauty and increased installation rigidity. A good finish begins with a good start. The TimberCrest® Perfection Shingles metal starter strip is used at the bottom of each side of the home to lock the first course of siding in place. Making your home stand out from the crowd. TimberCrest Board & Batten looks like real wood up close and on the wall, too. Our low-gloss, rough cedar texture creates a surface so real, it feels like it could give you splinters! Window Door Cap Sandstone (50/BOX) The Window/Door Cap blocks water from getting behind siding and causing moisture damage.